Biomass can be made up of any fibrous material such as used pallets, construction waste, downed trees, underbrush and invasive tree species, municipal waste piles or sub-merchantable wood. 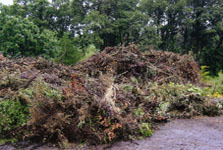 Lambert’s is one of the very few forest management companies that will remove biomass from your property. 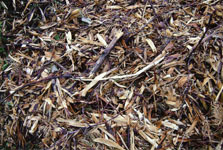 In addition to the aforementioned waste products, biomass includes the tree tops, limbs, needles, leaves, and other woody parts that most loggers leave behind. This practice leaves you with a more aesthecially pleasing forest, diverse and healthier growth, it decreases the risk from wild-fire and can increase and improve the habitat for wildlife. Leaving the slash on the forest floor can also make your forest more susceptible to insect infestation. For many, the removal of the biomass is considered an environmentally friendly process largely because the slash created during a logging operation can be chipped and used for the production of electricity or heat in cogeneration power plants. There can be some limitations for biomass harvesting. Terrain, types of harvests such as clear cutting vs. single tree selection, small volume sales, and depleted soil types. The State has developed biomass harvesting guidelines or BMG’s to assist in determining whether or not a site is appropriate for biomass removal. • Less emissions (sulfur dioxides, nitrogen oxide, mercury and particulates) than coal. • Woody biomass is carbon neutral. If not burned, wood releases carbon dioxide as it decomposes. 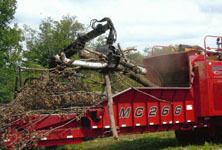 • Less ash is produced compared to coal, reducing landfill. • Promotes healthy forests and reduces the risk of devastating fires. • As a local product, the fuel does not have to be transported as far as coal sources. • Provides a beneficial use for material that has been considered a detriment and taken to the landfill. • Uses existing power plants and electric transmission lines. • One of the least-expensive forms of renewable energy. The delivered cost is much less than the cost of delivered wind and solar. • Benefits the local economy by generating jobs in the collection and transporting of forest and other wood products.